Pre-orders are now live! 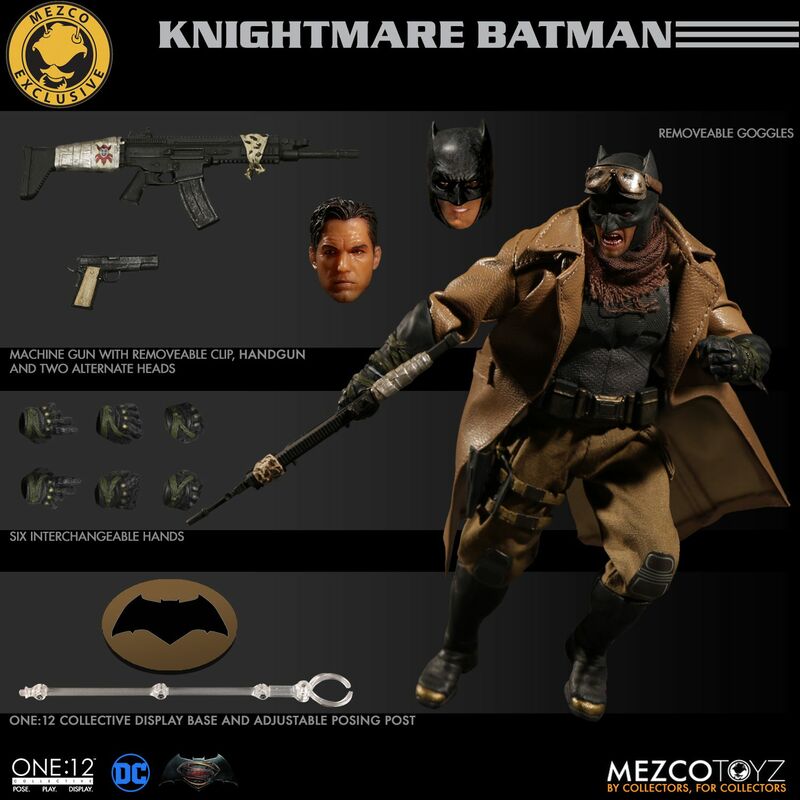 Check out the Knightmare Batman Pre-Order Page to grab yours while you can. You can see new photos of the figure by reading on. 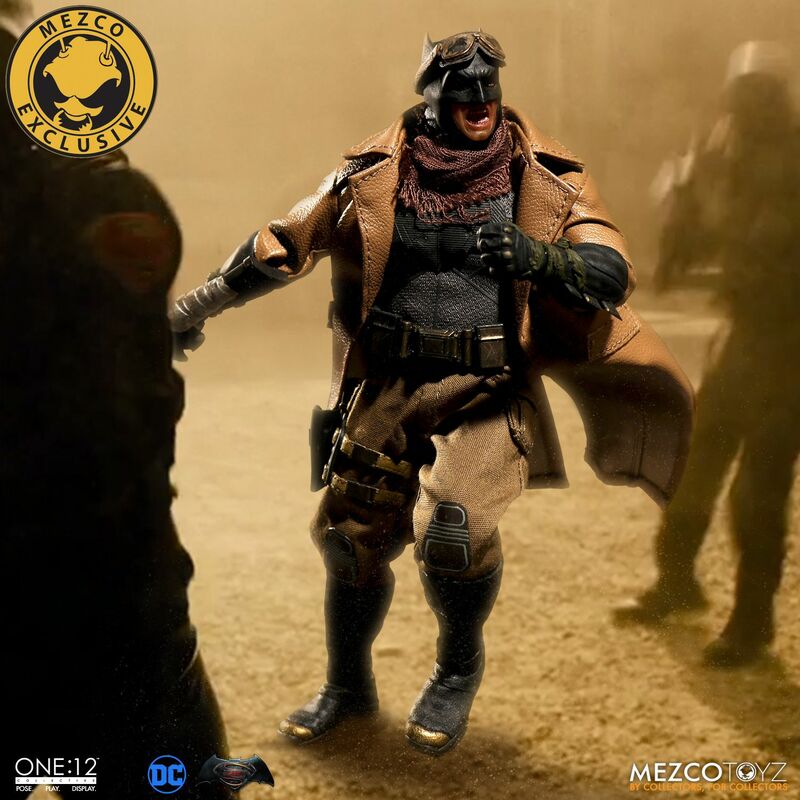 Batman v Superman - Knightmare Batman One:12 Collective Figure Will Be Released! It's like he's screaming "For Martha!". Damn son, I knew it!!! stoked!!! going to be an awesome addition to the line!! I thought maybe this was cancelled because they couldn't get the outfit to look right and figured no one would buy. Now the outcry has shown them people still want it despite the shortcomings. The scarf is a frayed mess, the jacket is unnaturally thick, stiff and doesn't look like it will ever sit comfortably with distracting stitching all over the inside and those printed knee pads are just lazy. What they've done with Netflix daredevil would be far superior. 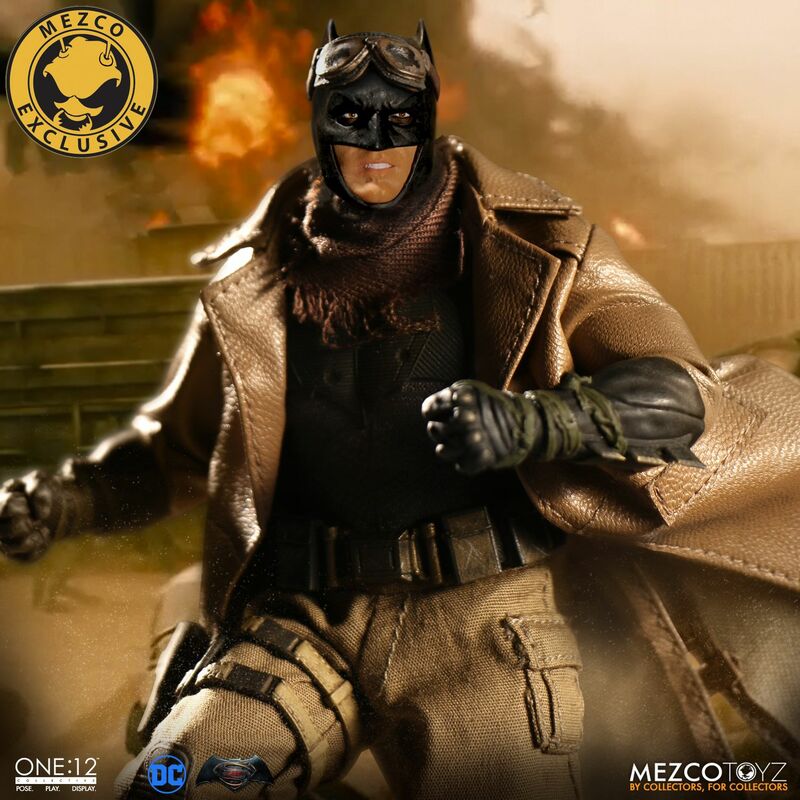 I love the Knightmare Batman design but looks like mafex will have to suffice. 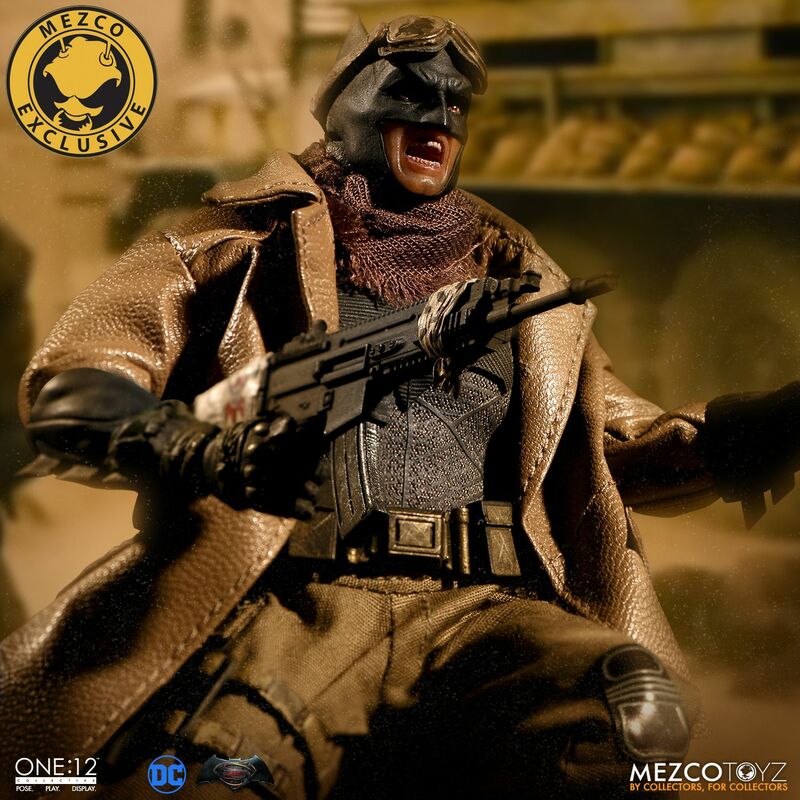 There's one positive here in that it shows mezco can actually add pockets to cargo pants. Wish they'd done that with the modern day Punisher along with some knee pads and a gun holster. The screaming head sculp is also great along with how they've integrated the gauntlets. I really wish this figure looked better and understand the restrictions in the 1:12 scale but just can't spend that much money when I'm not fully satisfied. Changing the jacket material may go a long way in changing my mind. This line has its flaws and shortcomings, for sure, but superior articulation and concealment thereof seems more important to many collectors. 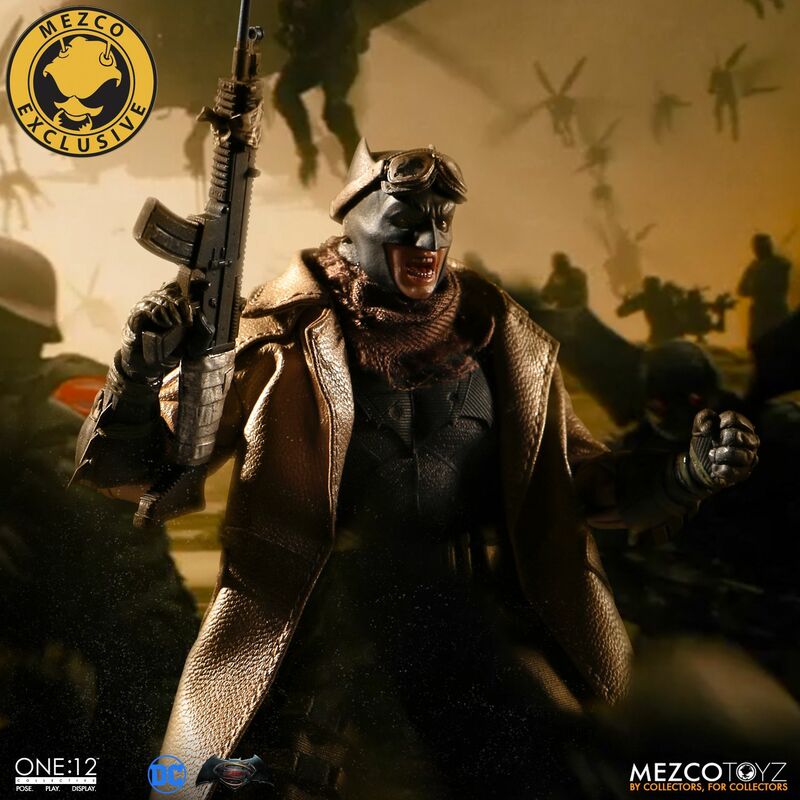 Batman vs. Superman: Dawn of Justice was a terrible movie overall, IMHO -- starting with the lame name -- but the Knightmare sequence was a stand-out highlight, and for that reason alone, I'm inclined to purchase the figure if it becomes available for shipping outside the USA. It's also reminiscent of Mike Mignola's artistic style. I would be particularly motivated if it comes with a second head sculpt with mouth closed, and if the goggles come down over the eyes. I'm so happy they decided to release this guy! 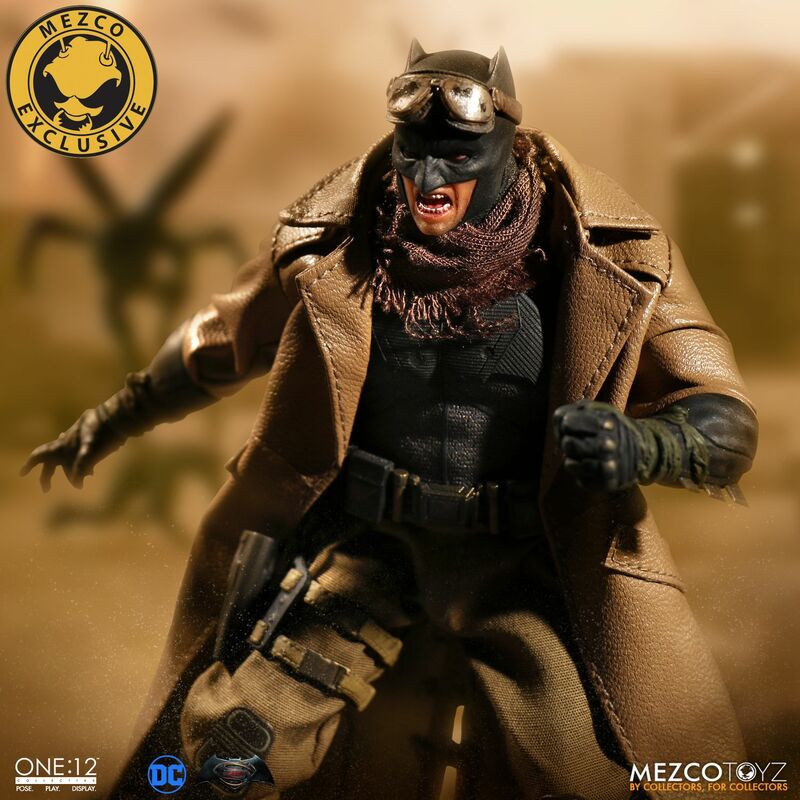 With Mezco, the final figure always looks better than the prototype, so I'm not worried about the jacket or the scarf. It'll look good, we just might not see him for a year, lol! 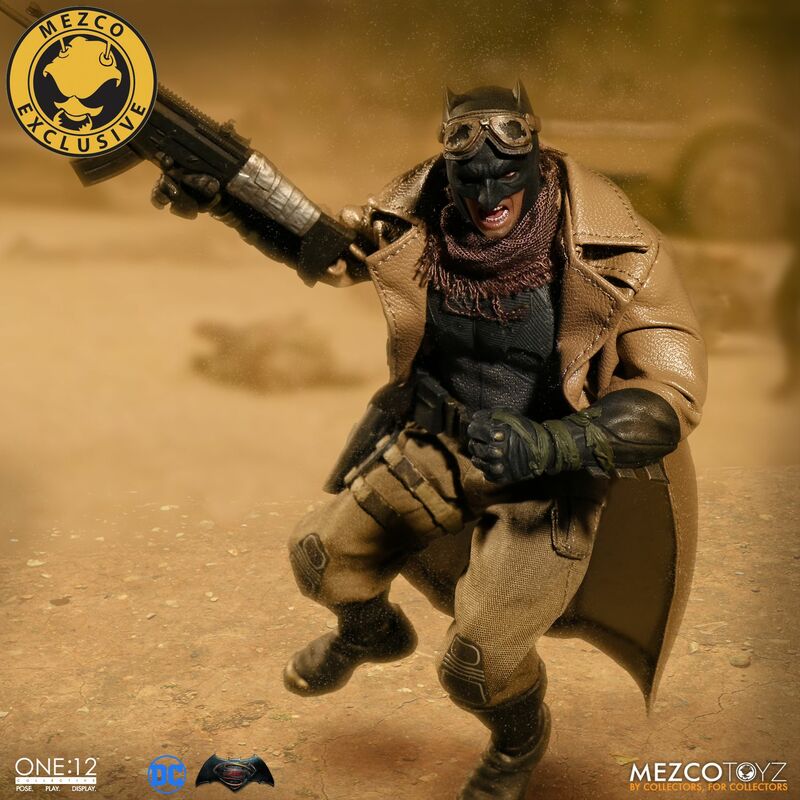 Since this is a Batman figure, Mez's favorite, you know it is going to be the finest figure they are able to make, no matter how many delays come up. I agree with everyone here saying that this figure looks less than desirable at the moment, but let's not jump to conclusions. I am very confident in Mezco's ability to clean up the figure and fine tune the soft goods. I really want this to turn out great even though that means I'll have to part with a load of cash but if my perceived issues aren't rectified then it'll be easy to pass. I'm just insanely fussy about any figure that's going to cost more than �55. The main thing stopping me from getting the Mezco Joker is the fact he doesn't have any sewn in pockets on his jacket. It's a real shame because the head sculpts are brilliant. If they do a version with a long coat (including pockets) I'll be all over it. don't care, i've been waiting forever for this fig, will definitely get it day one, looks amazing to me. Yeah.. 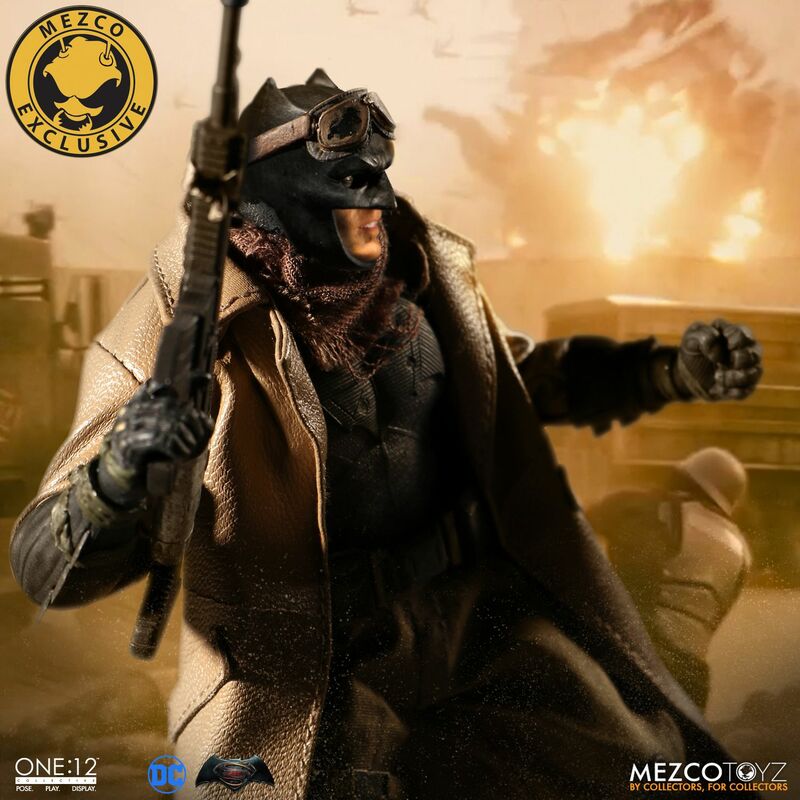 I still think these mezco 1:12 figures look goofy with soft goods clothing. And the price for them is just a bit too much. I'd rather pick up mafex or figuarts figures. 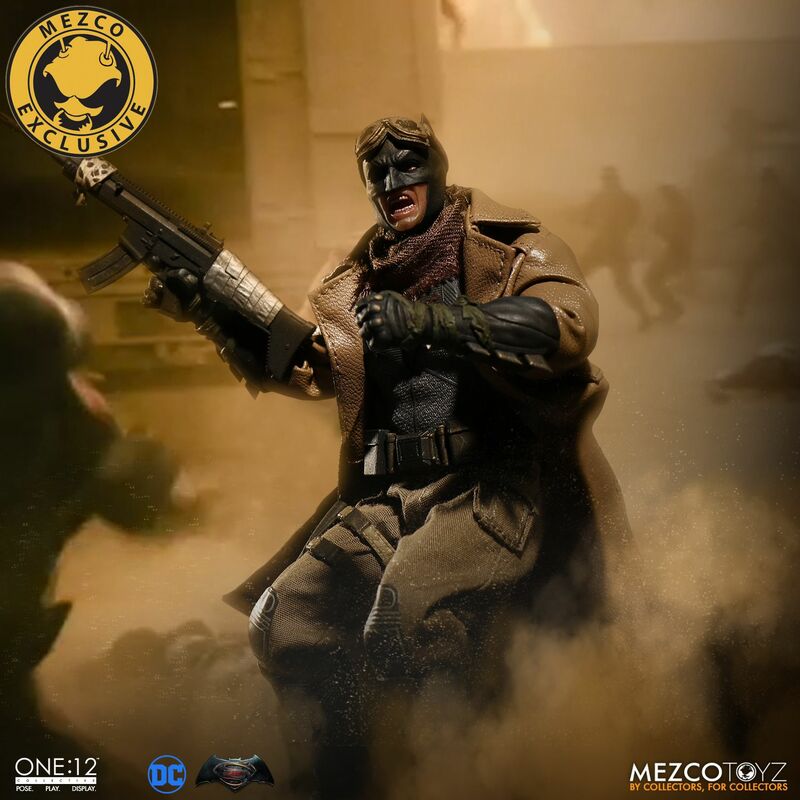 Does Mezco charge you when you preorder or when they ship? ^ It depends on the item. Often they only charge you once the item arrives and ships out. But in certain instances for their exclusives they require a non refundable deposit. 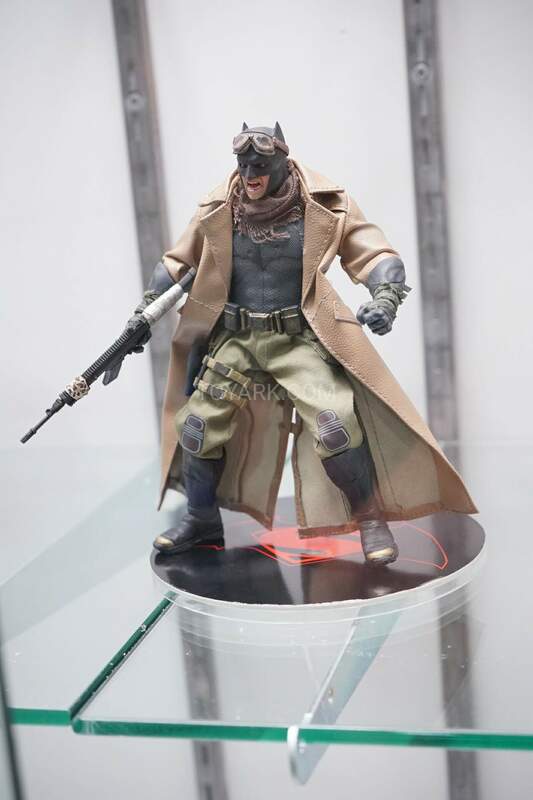 In the case for Nightmare Batman, a $20.00 charge will be required and then the rest will be charged to your card when the figure actually gets ready to ship. I will just never get used to the idea of Batman shooting and killing people. I refuse. This film was a disgrace. I like the look of this figure. Maybe BBTS or another Ark sponsor will make a deal to sell a few. I hate Batman V Superman with passion, seriously one of the worst movies but damn, I dig this figure. I have the Batman V Superman Figure from Mezco, ordered Punisher and Amazon sent me that figure by accident and let me keep it for free. I freaking love it and had I known how good it was, I'd have bought it. Pre-ordering this figure, it's just too damn cool. can also be used for normal Version of Batman. and will use the unmasked Bruce Head on normal Batman Figure. 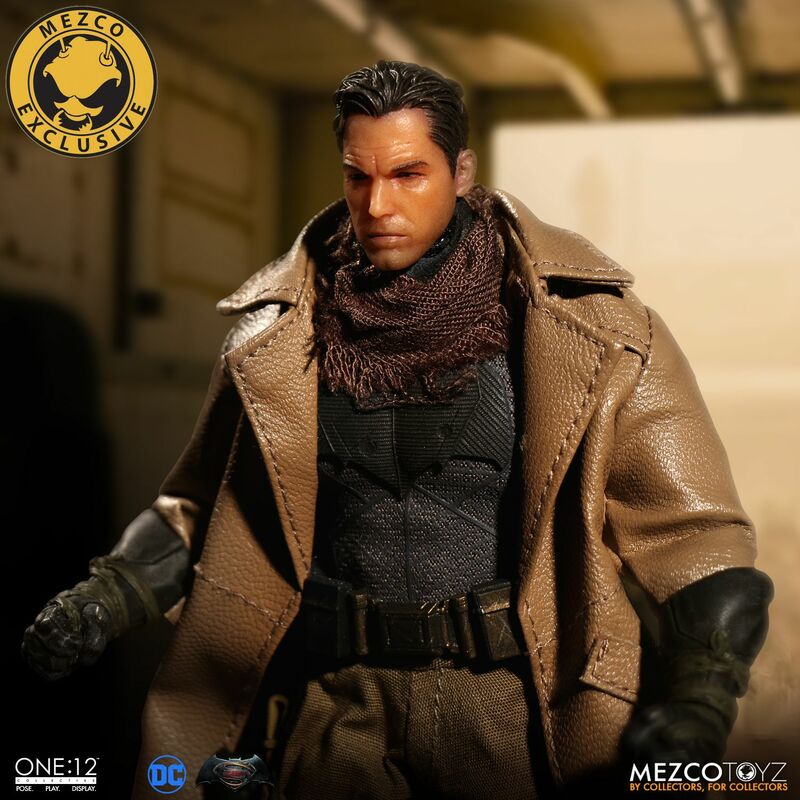 I still hope Mezco will improve the Bruce Wayne Head a little bit. One Eye almost closed looks a little bit strange to me but still very good sculpt. That's the clincher for me. They need to improve that. 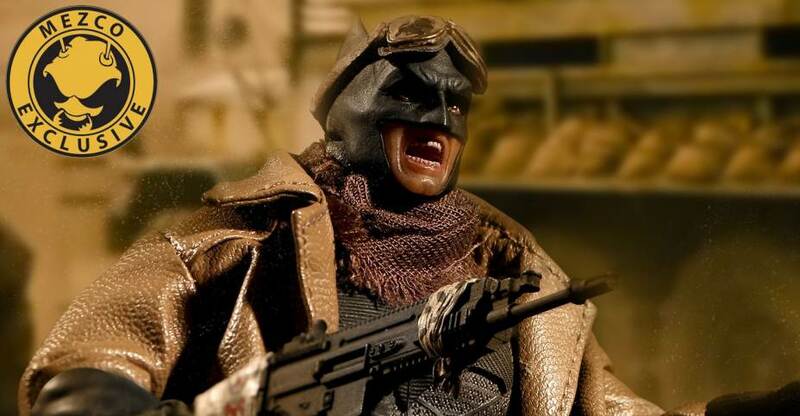 Batman figure wore it better. Looks more realistic. I just discovered that there was a pre-order for this figure on BBTS, and it's already cleaned out. Enough. Whenever I spot something upcoming that I like, it's gone before I even get a chance to pre-order. I'm done with it. Between this and border issues and scalping and foreign exchange and general hassle, the fun of collecting is gone. Screw it. Luck to all on the Ark. I've enjoyed our banter.